• Display all posts: 10 records. Monday, 07 July 2014 01:57 am / Posted by: Anuluck Nantajan. Monday, 07 July 2014 01:54 am / Posted by: Anuluck Nantajan. 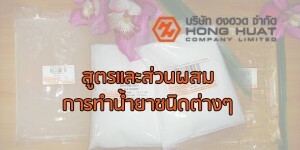 สูตรการทำ น้ำยาล้างพื้นฆ่าเชื้อโรค (Floor Cleaner) Procedure : Mix thickener with some part of water. In another vessel, heat up remain water to 60oC after that add mixture from No.1 into vessel, mix until it clear. Add M-LE1019 and Sanisol RC, AMPHITOL 20N, 50%NaOH and mix until homogeneous. Monday, 07 July 2014 01:49 am / Posted by: Anuluck Nantajan.